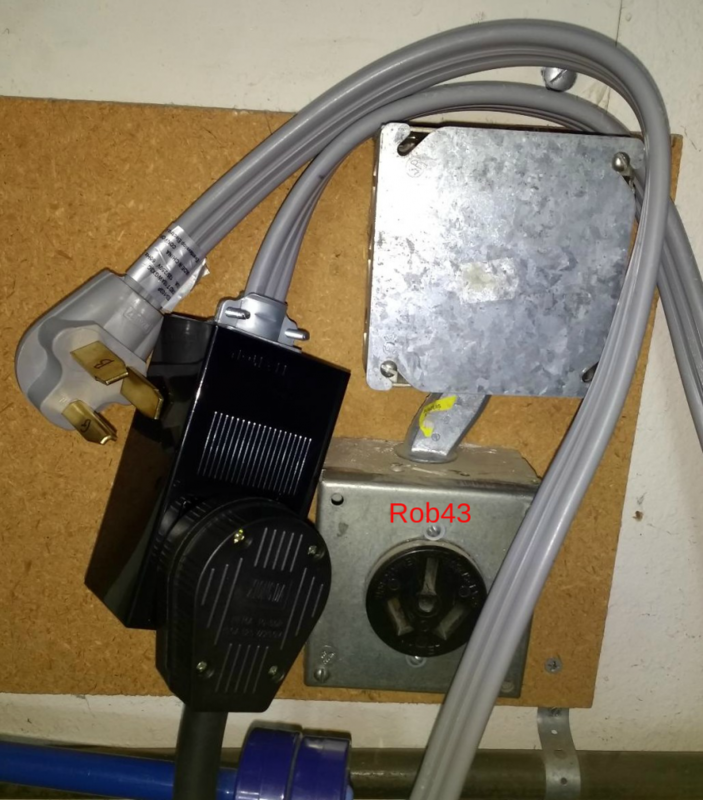 Discussion in 'Prime Plug-in Charging' started by Rob43, Mar 16, 2019. Good luck getting that plug into that receptacle. Merkey, bruceha_2000 and Leadfoot J. McCoalroller like this. Good idea, but it doesn't look to me like the plug and receptacle match. The center connectors look different, at least in the picture. *** This does not work any longer. I just did this conversion. Still charges at 120v. Installed a 20a dual breaker, NEMA 10-30 outlet, bought a NEMA 5-20 to NEMA 10-30 converter. Checked continuity, Both hots went to each leg, including outlet from and to breaker. Tested with meter, 120v at each. Just a "FYI". So don't waste your time like I did. Time to shop for a REAL 240v charger. Post up the Exact model number of your charger to see if yours is different. 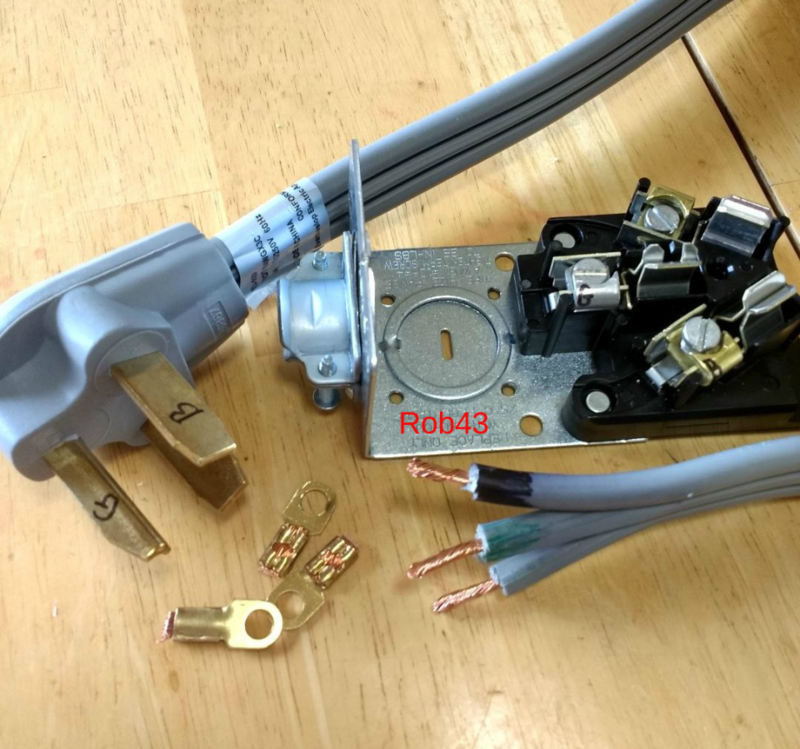 Everyone with a G9060-47130 Toyota Prius Prime charger has had complete success with this. Just curious. Did you have 240 between the two legs? If it's wired properly and the converter you bought is behaving as expected, I don't see electrically how it could not work. @Joeteck's post notwithstanding, too bad this is a 120V. Wonder if there is a 240V version. Very compact, just changes the male plug type, no cord involved. Could tape it to the EVSE plug so there would be no chance of a 240V outlet looking like a 120V. I was expecting it to show 5 minutes, but showed 30 minutes. So I thought it was not working correctly. If one wanted to strive to make their traction batttery last the longest (degrade less over the life of the car), which is better L1 or L2 charging? Or does it matter? When it comes to the Prius, I wouldn't split hairs too much over it. Like most EV mfgrs, the battery is built over spec to account for some losses over time. For example, my new Prime has a capacity of 105.3%, providing some overhead as the pack ages. Just plan for a pack rebuild in 10-15 years to get your EV range back if you plan on keeping the car forever. By then, rebuild prices would have fallen and lithium pricing in general. Heck, maybe by then graphene supercapacitors would have fallen in price enough to retrofit for ~5 minute charge time. 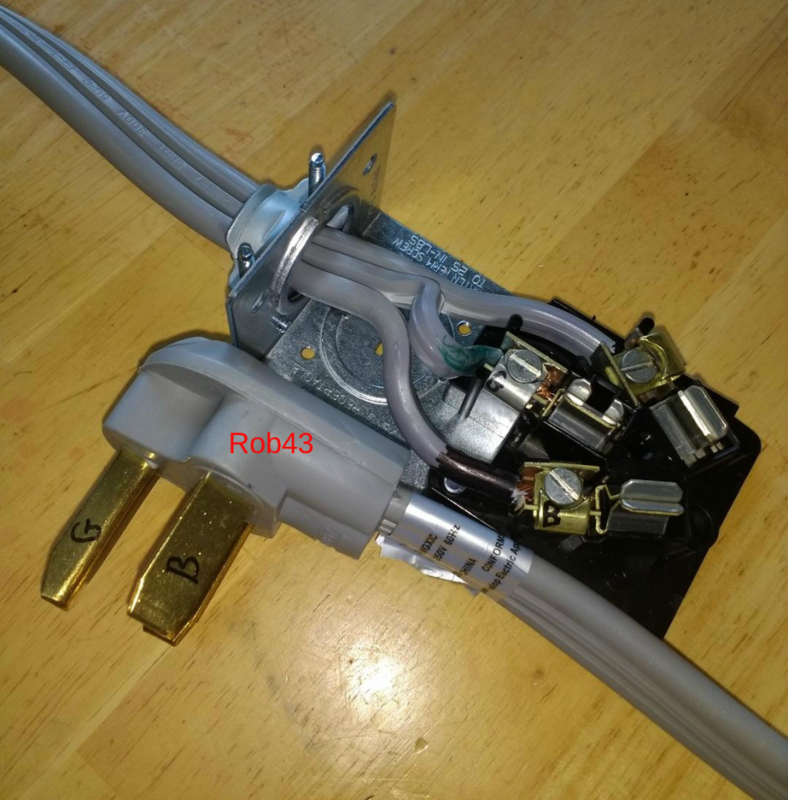 Based on an upcoming trip later this summer I decided to build this second 10 AWG 6 foot long adapter which uses a NEMA 10-50 receptacle and a NEMA 10-30 plug. The Airbnb that I'll stay at for a week+ does not have any type of car charger setup, just the typical 120v slow outlet. After some inquiry I had them take pics of their dryer outlet, it uses the fairly common NEMA 10-30R (receptacle). 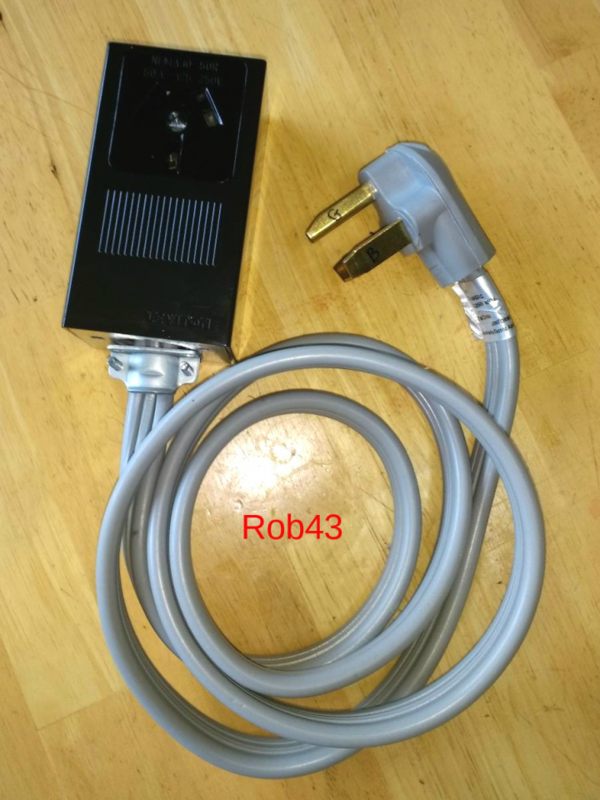 My current 25 foot conversion cord that I built in post #1 uses a NEMA 10-50P which doesn't work at the Airbnb, so my 10-50P will plug into my new 6 ft long 10-50R, and then the 10-30P will plug into the Airbnb's dryer outlet. Total length for all cords is roughly ~55 ft, this is still completely fine based on the chargers amp draw while using a 10 AWG copper wire. This once again shows how Super Cheap it is to build your own conversion plug, total cost for this mini project was $17 dollars and it only took minutes to assemble. 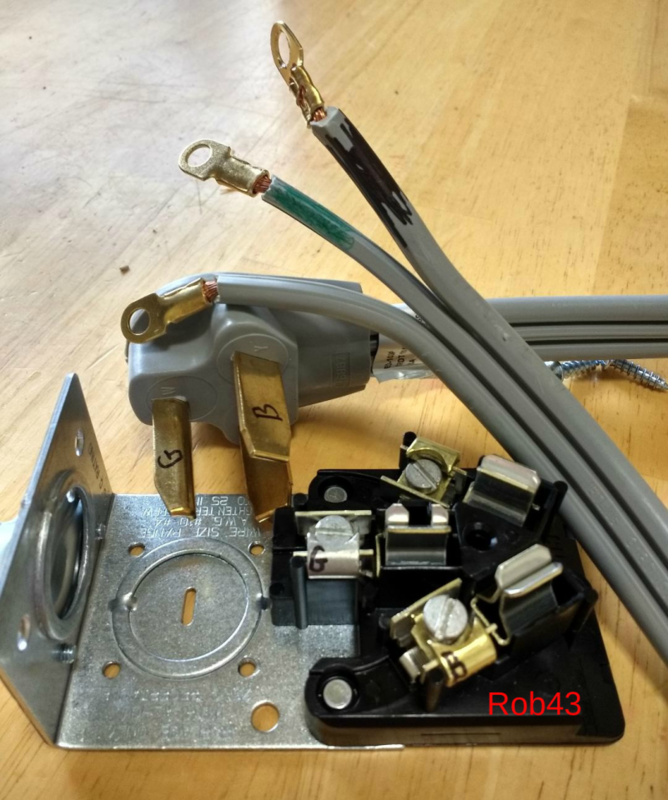 If you have a conveniently located 240v outlet, building and using a 120v to 240v conversion cord for fast 2 hr and 25 minute charging is a very satisfying project.  Good, tell everyone about your new charging experience after you have a few days of using it. It's fun putting it together, take some pics if you can. I think I will not use the adapter cord often, cheaper is better. I only have dryer outlet indoor, so the cable need to go through garage door and let the door partially open. Any here's my calculation, to fully charge the car need about 6.5 KWH. Our electric rate is $0.18, so that's $1.17. Suppose EV can run 25 miles, if use gasoline, 25/55 = 0.45 gal. Current gas price is $2.65, so 0.45 gal is $1.2. EV $1.17 vs gas $1.2, only 3 cents saving per charge. Our electric rate is $0.18, so that's $1.17. Suppose EV can run 25 miles, if use gasoline, 25/55 = 0.45 gal. Current gas price is $2.65, so 0.45 gal is $1.2. EV $1.17 vs gas $1.2, only 3 cents saving per charge. You live in high electricity rate area as I do. As you stated, in those areas at a current low gas price, the EV is not a saving. I have been watching the gas price going up last few months, and every time it goes up, I grin with pleasure. I can't wait to see it gets above $3. Curiously, does your electric company offer off peak rates ? They do, but you need pay higher rate for on peak, which is 7am to 9pm. For winter maybe ok, for summer the AC use much more electricity. The Prime is only 6.5 kWh and not everyday. Not a good choice. I did use the EV rate when I was in GA with a Nissan Leaf. Tried first time, got full charge in 2.5 hrs, the highest temp on EVSE is 89 degree. Safe to use a 12V Power inverter with my Prius Prime Advance? Can you use an older Prius Plug In charger with the new Prius Prime? Anyone use public charging stations for your Prius Prime? Should I leave the Prime plugged in when not in use and charge is complete?